As I regularly do these past few weeks, I messaged my great, amazing friend ❤ Mischenko ❤ to talk about this and that. I’ve got a lot going on in my life currently and she’s really good at listening, laughing at with me, and generally giving me some really great advice. I forget how we got on the subject of anime movies but I remember asking her if she had ever watched Howl’s Moving Castle especially since I knew her kids would love it. Her daughter, especially loved the movie because she got it for Christmas. This of course led to further anime movie discussion and I got to thinking about the things these Studio Ghibli films have in common. So today I thought I would share with you some of my favorites and why they’re so fantastic. 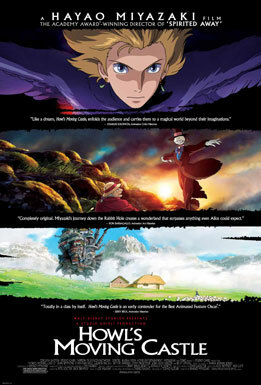 Howl’s Moving Castle is a story about beauty, curses, and overcoming your inner demons. Sophie is the main character who leads a very boring life until one day she meets a powerful wizard named Howl. He’s being chased by the evil witch’s shadow demons and Sophie unknowingly comes to his aid. The witch then gets jealous of Sophie and curses her by stealing her youth and beauty and turning her into an old lady. From there Sophie joins Howl, Markl and talking flame Calcifer in the castle and learns about this world of magic as well as the additional curses and struggles this little family is going through. It’s really a great film that teaches a person that you are stronger than your inner demons ans when you have a nice family backbone to help you, you realize that beauty comes in all forms, shapes and sizes and believing in yourself can enable you to believe in the unimaginable. 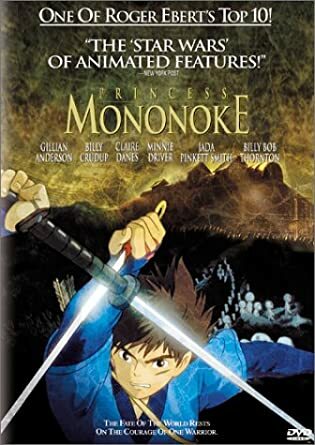 Princess Mononoke is a story featuring natives living and working the land when a living disease infects one of the animals they normally hunt and begins to plague the people and land it treks through. Ashitaka, prince of the village, gets in the path of disease to save his sisters and the cursed plague infects his arm which has a few alarming effects. He decides to go on a journey to find a cure for the curse. Along the way he meets a wildling girl named San who was raised by wolves and is trying to drive the modern coal farmers away because they’e destroying the forest and the forest Gods are not fans of this and have decided to fight back. It’s a war of nature versus the mechanical all while trying to cure this nasty plague. This film is a little bit darker than the rest of the Studio Ghibli films but the main takeaway is how important the environment is and why it’s essential that we save it. It’s also about compromise — informing an individual why you feel the way you do without shoving your anger and hatred down their throat; making them open their eyes and mind and seeing a different side of the coin. Spirited Away is a story about a little girl who has been told by her parents that they are moving. She is quite reluctant to do so because she’s built such a home where they are now. While driving to their new home, they take a wrong turn and Chihiro and her parents is pulled into a world they never imagined. Her father insists one exploring this area and they stumbled upon some delicious looking foods. What they did not expect is the side effects of eating food in this magical place — they turned into pigs! Chihiro is frantic and all she wants to do is go back home but she has to figure out how to get her parents to turn back into humans. She ends up discovering all types of things about the people of this world, the culture, foods, and even makes friends with a boy who can turn into a dragon. The main takeaway from this film is courage; To not be afraid to face the unknown and have the courage to overcome your fears. Life isn’t planned out for you where you know exactly what’s going to happen when. You probably hear this all the time but you really should live life to its fullest. Fear holds you back from what could be the greatest moments of your life. And if they aren’t, well, you learned a lesson which makes you smarter, braver, tougher and more able to handle anything life throws you in the future. Nobody is perfect but if you make the best of the hand you’re dealt, you will find that you can conquer the world. Since this post is coming up on over 800 words and I didn’t know I had all that in me, I’ll leave it at these three today. I still have a couple more movies I can talk about but I’ll leave it for a later post. I also want to note that I originally watched all of these in their Japanese version with English subtitles but now there are English voice acting versions if reading this post has you intrigued. These are better than Disney right?!?! 😉 Have you seen these three movies or any Studio Ghibli film? What do you think of the takeaways I got from these? Let me know your thoughts in the comments below! I’m so glad you shared this post. Your descriptions and takeaways are spot on and I want to watch them all over again. We loved all of these, but I really need to watch Princess Mononoke because I’ve only seen parts of that one! Wondering if it’s on Netflix or Amazon. The one that sticks with me most is When Marnie Was There. I have a real attachment to that one and the kids love it too. Oh my! Only parts?? Yes, you definitely have to! If I lived near by I’d loan you my DVD. I’m feel like I’ve seen When Marnie Was There but I can’t remember. I love spirited away. I haven’t seen the other two, I’ll keep them in mind next time I’m looking for something to watch. They are, I love Howl’s Moving Castle! Oh gosh- I’ve been meaning to see these for years and haven’t *hangs head in shame*. I even read the book for Howl’s moving castle in advance- and I haven’t got the faintest idea why that slipped my mind!! And Spirited away is such a huge deal… seriously- what’s wrong with me?!? hehee yes! I will do!! LOL!